The Hawke Sapphire ED binoculars are available in an open-hinge 43mm design as well as the smaller, cheaper 42mm top hinge. For this review, I will be looking at the 8 and 10x42mm models, which retail for £359.95 and £369.95 respectively (correct as of February 2014). The 8x42 model has recently been awarded the 'Best Birding Binocular 2013' in the BBR Annual Binocular Awards. Having used the Sapphires at numerous intervals in variable conditions, I now feel well placed to give them a fair review. If you're considering spending £300 plus on binoculars, you're most likely going to want to use them regularly and throughout the day. The Hawke Sapphires feature fully multi-coated lenses, BAK4 prisms, dielectric prism coating and ED glass. A lot of techy stuff, eh? Let's simplify it a bit. At this price, we'd expect the BAK4 prisms and fully multi-coatings, each ensures as much light as possible travels through the glass elements. The dielectric prism coating increases the light gathering capability further, potentially more than 99% in fact. Finally, the ED glass eliminates something called chromatic aberration (CA) or purple fringing. You may notice this on binoculars without ED glass at the edges of objects, particularly against a bright sky. All in all, these coatings and elements ensure the Sapphire EDs provide you with an incredibly bright, sharp image right up to when darkness falls. Contrast is excellent, colour rendition is accurate and the 8x42s pack a whopping 8.1° field of view, just about one of the highest on the market (matching the Frontier ED 8x43s). They perform significantly better than the Frontiers at the edges though, making better use of the wide field. The 10x42s feature a 6.4° FOV, which although is significantly less than the 8s, is still pretty good for a 10 and again it performs well for edge sharpness. Close focus is stated at 2m, though in testing I could get nearer 1.5m with the 8x42s and 1.8m with the 10s. The ED glass certainly does its job, with CA unnoticeable to my eyes. When compared to Opticron's Countryman models, which are one of my personal favourite pairs for optical quality, this is a big plus as the Countryman's suffer (though not heavily) from purple fringing. Everything else between the two pairs is incredibly similar, mind you. Having spent an hour with a customer looking at both in the 8x42s at dusk on a December evening, both of us struggled to tell the two apart, with the accessories ultimately proving to be the deciding factor. Being made from a lightweight magnesium alloy and covered in a combination of smooth and textured rubber, the Sapphires feel well made. The eye cups twist out easily and at full relief lock nicely, though there's a bit of play at half relief. To reference the Opticron Countrymans again, which are made in Japan rather than China, you notice the difference, with the Opticron models offering a firmer resistance to movement. The adjustment diopter is placed on the right barrel below the eye-cup and is firm yet easy to adjust, though not lockable. The objective lens caps are the fold down type, placed in a small protrusion built in to the body, but are still removable if you don't want them on. To protect your investment from the weather, Hawke have made the Sapphires fully waterproof and nitrogen purged. This isn't just shower proof either, as they in fact tested their waterproofing for 3 minutes under 1.5m of water. Impressive enough, but add on the water repellent objective lens coatings and you've got yourself a well built pair of binos that don't need rigorous cleaning as often as others. At 730g, the Sapphire EDs aren't the lightest on the market but with the padded strap provided, they are no burden to carry around. With the thumb rest indents on the underside of each barrel, they're incredibly comfortable to use too. The focus wheel is smooth, not requiring fine adjustments like some but quick enough to be able to change focus rapidly when required. 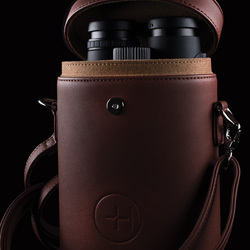 As pictured, the Sapphire EDs come in a genuine, terracotta leather case, which is to some people's taste but not others. It's certainly good quality anyway, as is the previously mentioned neck strap. The cleaning cloth is, as with all of Hawke's binoculars, basic, though we needn't get hung up on that. You also get a 10 year warranty, with Hawke being a polite, friendly company to deal with. So all in all, I've been more than impressed, so let's get to the scores. When reviewing numerous binoculars, I endeavour to be as unbiased as possible and to give a fair score relative to the cost of the binoculars. Up to now, I hadn't given any pair a 10/10 for Optical Quality, though I simply couldn't fault the Sapphire EDs given their modest price tag. 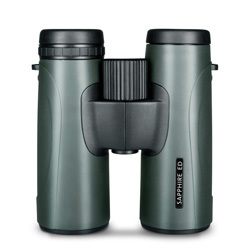 The similar Opticron Countryman is well known amongst birders for being fantastic value for money and for me, the Sapphires optically offer everything the Countrymans do and more. I can certainly see why they have been awarded the acclaimed 'Best Birding Binocular' award. 2019: Hawke have discontinued the Sapphire ED range and have replaced it with the Frontier ED X.